We’re excited to announce the latest addition to our mighty slim protective line of tablets: DuraFolio for iPad Air and iPad mini with Retina display! With years of design work backing up this new product, we’re here to answer any and all questions you may have about our first ever military-grade protective tablet case. 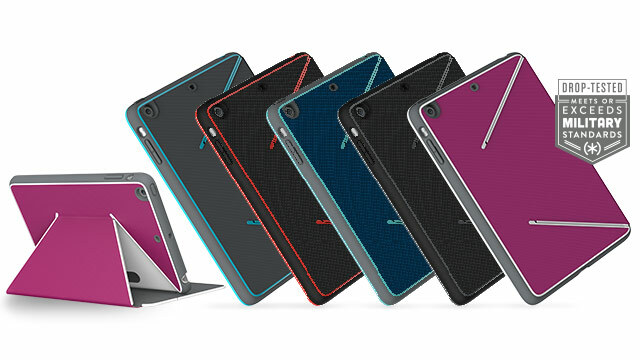 There are some good-looking tablet cases out there, and then there are protective tablet cases- but you can’t always have both. Speck found a way to solve this with our DuraFolio, an extra-protective tablet case that isn’t bulky in design or appearance. Its military-grade drop protection is harnessed into a slim, functional, and versatile folio that frees you from making a compromise between style and protection. With DuraFolio, you can have it all. What is DuraFolio made of, and how does it protect my iPad? Its construction features a hard polycarbonate shell and a grippy TPU bezel for enhanced drop protection. Molded polycarbonate cover panels protect your screen from drops and prevent the cover fabric from fraying. The vegan leather has our signature diamond-pattern texture that ensures better grip, reinforced protection, and a soft microfiber liner to keep your screen clean. What makes DuraFolio so special? Military-grade drop protection. Dual-layer design delivers unsurpassed impact protection. Its Versatile Folio. Multiple viewing angles and an integrated typing mode let you use your tablet exactly how you want to. Slim profile with a sleek, mighty construction. Only adds 0.3” depth to your iPad and has molded hard polycarbonate cover panels for extra strength. Textured and rugged finish. For added grip and reinforced, durable protection. Magnetic cover. Screen protection coupled with auto sleep/wake and magnetic closure for a secure hold when cover is closed. Seamless construction. Fluid lines and layered construction give you a more sophisticated, premium style. that still allow full access to all of your tablet’s important parts. Natural sound. Flows effortlessly through protective speaker grills. Rigorously tested. The vegan leather fabric passed rounds of testing against thermal cycle temperature and abrasions. What does military-grade protection really mean? This product meets or exceeds MIL-STD-810G standards. This means that the DuraFolio was drop tested onto a hard, unrelenting surface with the tablet retaining full functionality and no damage to its screen or buttons. What are the dimensions of DuraFolio? How much does DuraFolio weigh? Is this product backed by a warranty? DuraFolio is backed by the Speck “Long Live Promise,” our 1-year warranty. Learn more here.